MachPanel has made synchronization of your AD users between multiple platforms fairly easy and provides industry’s best Azure Active Directory benefits. With MachPanel you can experience working with best Automation tool for Directory Sync for your SaaS business. With MachPanel ADSync, you can experience the feature on same Sign-On across multiple platforms like SharePoint, Exchange, CRM, Hyper-V, Skype for business in your SaaS business. With multiple profiles, you can get Synchronizations amongst multiple Hosted cloud environments. You can get on-premise Active Directory with Hosted Active Directory Users. MachPanel provides you with best after sales support. Along with this, there is a comprehensive configuration guide and installation guide presented in MachPanel’s knowledge base. You can easily get Multiple OU synchronization ability amongst two active directories. You can schedule active directory synchronizations based on your organizations demand an as you desire. You can get usage details of ADsync in the form of detailed Reports for each organization. MachPanel provides you to achieve a competitive edge in the market. 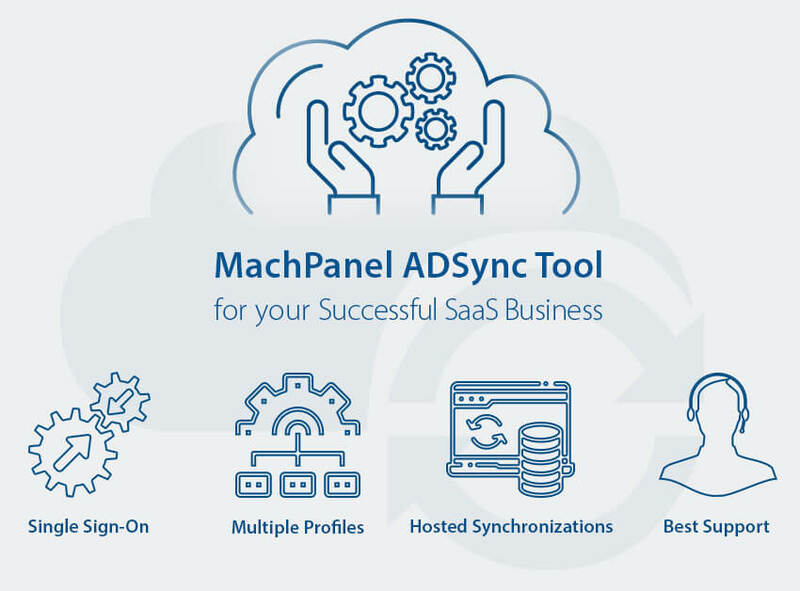 MachPanel ADsync Tool deserves special attention for CSPs and entrepreneurs of SaaS business. It keeps all cloud users updated with one-way synchronization. In addition to that, all active directory admins can automatically keep the newly created on-premises AD synced with hosted AD. With MachPanel automation module for ADsync, automation and synchronization are made easy. Get this module for your business so that you never have to worry about any Directory Synchronization again. This entry was posted on Tuesday, February 12th, 2019 at 2:36 pm	and is filed under Active Directory Synchronization. You can follow any responses to this entry through the RSS 2.0 feed. Both comments and pings are currently closed.